﻿ PIATRA CRAIULUI National Park, Carpathian Mountains – ROMANIA, Travel and Tourism Information. Piatra Craiului Natural Park features the longest and highest limestone ridge in the country (over 15 miles long and 6560 ft. high). Bordered by glacial lakes, the ridge is regarded as one of the most beautiful sights in the Carpathians. The two-day north–south ridge trail is both challenging and rewarding. Starting at either Plaiul Foii in the northwest or Curmatura in the northeast, hikers climb up to the ridge along the narrow spine of the range. The descent at the southern end leads into a karst landscape of deep gorges and pitted slopes where water penetrating the rock has carved a series of caves. The traditional villages of Magura, Pestera, Ciocanu, Sirnea, make for interesting starting points for the routes on the eastern slope and for getting in touch with the traditional Romanian way of life. 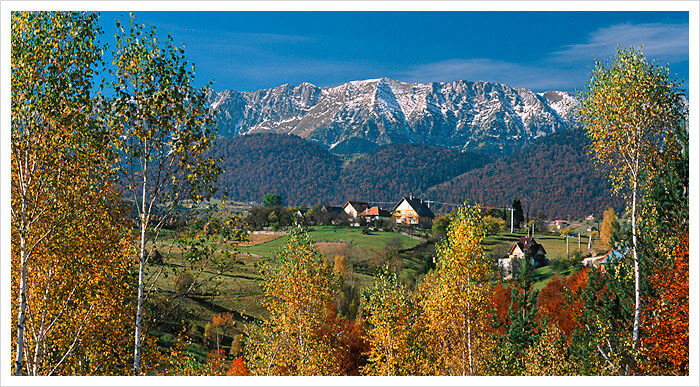 Best known for: The most spectacular ridge in the Carpathian Mountains. Sheltering one of the largest biodiversity of wildlife in the country, the national park is home to about 300 fungi species, 220 lichen species, 100 different mosses, and 1100 species of superior plants (a third of the number of all plant species found in Romania). On the high cliffs there are chamois, wild boar, red and roe deer, pine martens and red squirrels. Some 270 butterflies species, 110 birds species, 17 bats species, many large carnivores (wolfs, brown bears, lynx) can be observed in the park. The gorges are a good place to see wallcreepers and alpine swifts, three-toed and white-backed woodpeckers and Ural owls in the forested areas. Zarnesti, located 18 miles southwest of Brasov and accessible both by road and by railway, is the most important town for access to the northern part of the ridge. From Zarnesti, a 6-mile road makes the connection with Plaiul Foii; a forest road starts from the southwestern part of town, going through Prapastiile, Valea Cheii and Valea Vladasca. The villages of Magura, Pestera, Ciocanu and Sirnea are starting points for hiking routes on the eastern slope. Podu Dambovitei is the point of approach from the south. From here, the national road DN 73 branches off to the road on Valea Dambovitei through Saticu de Jos and Saticu de Sus, from which several hiking routes lead to the western slope of the Southern Ridge.